We specialize in Individual taxes, small/medium business accounting, taxes, payroll, tax planning and business consulting besides representing for audits before Federal and State tax authorities since 1993. 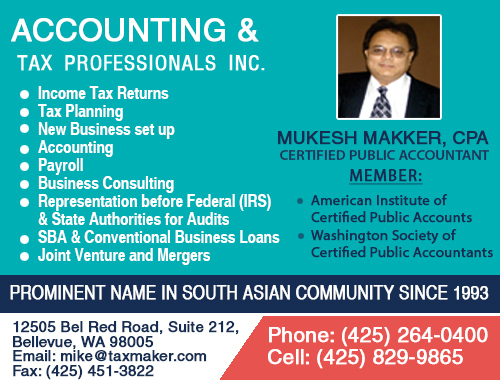 With more than 24 years of experience in the accounting and taxation, our firm is well known in South Asian community in Washington and adjoining States for sound, accurate, affordable and friendly advice. We can help you with International Taxation. International Taxation and Business consulting. We are a CPA and an Enrolled Agent firm specializing in Tax Planning, Compliance and Preparation. We provide a wide array of services that cover every aspect of your business and personal taxmatters. Our relationship to our client extends beyond merely offering standard services for their tax and business needs. We represent tax payers for audit all the way through IRS Appeals Division. We are well versed with International tax reporting, especially for non- resident aliens, resident aliens and U.S Citizens with International tax ramifications. We keep ourselves posted of developments in International tax reporting arena - so you are not hitwith massive non-compliance penalties by IRS. * Individual Tax/Business Tax - preparation, planning and compliance. 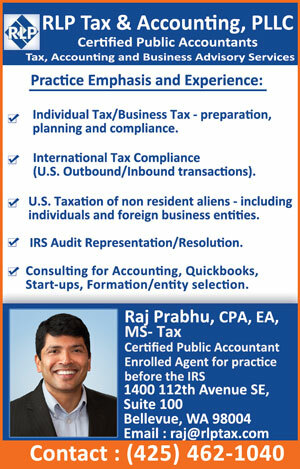 * International Tax Compliance (U.S. Outbound/Inbound transactions). * U.S. Taxation of non resident aliens - including individuals and foreign business entities. * Consulting for Accounting, Quickbooks, Start-ups, Formation/entity selection.